These two cakes were made for a dual birthday party for a brother and sister! 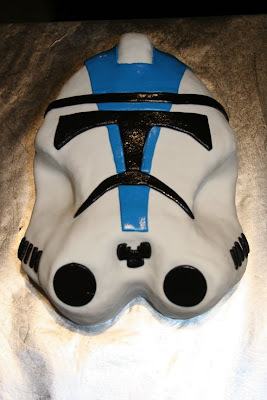 The clone trooper is milk chocolate with raspberry filling carved out of two 1/4 sheets and covered in fondant. Rodney carved this cake out, he did such a wonderful job! 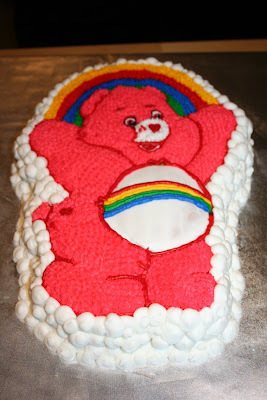 The care bear cake is obviously from the Wilton character pan line. The only thing I changed regarding the original design is that I added the cloud detail around the sides of the cake, which I ended up liking a lot! This was a plain white cake with vanilla buttercream. These cupcakes were made for a cake testing I did this weekend for our very good friends, Amy and Tyler. I got a few ideas as far as flavors go from the two of them and then sort of came up with a few ideas on my own for them to try that I thought they might enjoy. lemon with strawberry buttercream, chocolate with vanilla buttercream, chocolate with chocolate-mint buttercream, key lime with vanilla buttercream and key lime with strawberry buttercream. I have to say the key lime and vanilla with strawberry buttercream were exceptionally good. This is the first time I have tried making a strawberry buttercream and it really exceeded my expectations. I didn't really follow a recipe so I'm glad I wrote things down as I went! It really was good. Amy and Tyler agreed, Rodney liked the bowl! 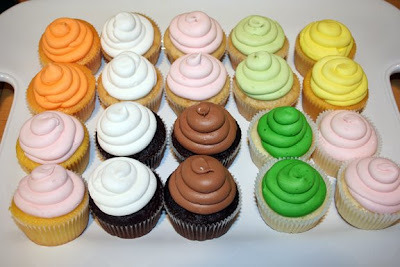 As much as I am always awed and impressed by your fancy cakes that look like non-cake things, I equally love how lovely your simple cupcakes are. Um...Yum! You are so making Sofia's birthday cake for me!!!! Great job again! 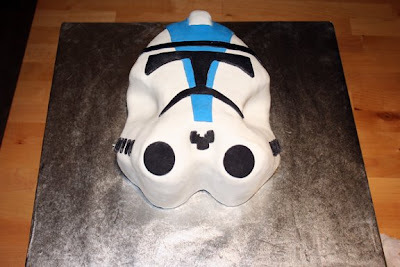 Love the storm trooper! You did such an awesome job!